Have you ever been bustling along and had your mood take a hit, because a glance in the mirror revealed that you didn’t look like the go-getter you felt like? Dark circles under one’s eyes can make you feel like you’re as tired as you look. Don’t let something so small rain on your parade! Here are a few tips that can really make a difference. People tend to blame lack of sleep for dark eye circles and puffiness, but if you suffer from seasonal allergies, an extra nap may not be the answer. Seasonal allergies can cause inflammation, especially in the blood vessels in your face—and that’s particularly noticeable in areas with thin, delicate skin, i.e. under your eyes. An over-the-counter antihistamine might be the answer, but if that doesn’t work or causes unwanted side effects, check with your doctor for a prescription solution. Sometimes, it’s not the amount of sleep you’re getting, but the position you’re sleeping in. Try sleeping on your back and adding an extra pillow or two (or replacing your pancake-flat pillows that you’ve had since college!). This can help prevent fluid and blood build up under your eyes and could be a powerful anti-puffiness solution. Good news: chocolate can help. No, seriously. Foods high in flavonols, such as higher percentage dark chocolates, can fight dark circles under your eyes. For once, chocolate therapy is better for more than just your soul! Omega-3 fatty acids are another great skin-saver. Indulge in your favorite nuts (walnuts are particularly high in these helpful compounds) or up your protein intake at the same time with a nice salmon fillet. Collagen helps maintain the elasticity and overall health of your skin. Your body produces collagen, but you can help boost production and boost your collagen levels with a collagen supplement as well. Our YANA™ Daily Collagen Drink supplement can help, and it also contains other vitamins and antioxidants necessary for radiant skin. 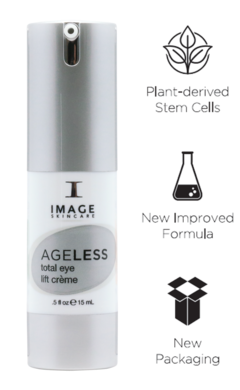 • Our AGELESS total eye lift crème soothes irritated and tired eyes with green tea, coneflower and chamomile, and it tightens the skin with a retinol-derived retinyl glycolic blend. • The MAX stem cell eye crème with Vectorize-Technology contains edelweiss, argan and grape stem cells to revitalize your skin and reduce the effects of stress, tiredness and aging. • Our VITAL C hydrating eye recovery gel helps fight the effects of dehydration and dry skin, which in turn reduces the appearance of dark circles under the eyes while nourishing your skin with antioxidants that slow the effects of aging.